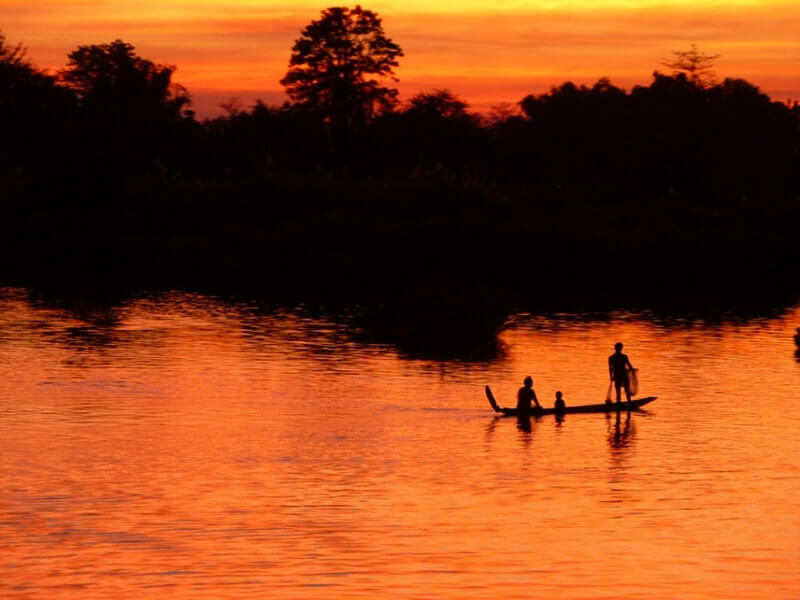 Our Undiscovered Southern Laos & Cambodia tour will provide you with a truly ‘off the beaten track’ experience when travelling in these two fascinating countries of Laos and Cambodia. Trek to pristine waterfalls and through villages untouched by time, then stop to meet friendly locals on the way. Discover ancient Khmer temples in southern Laos, venture into remote Ratanakiri Province in northeastern Cambodia. Cruise on the Mekong River, exploring the 4000 Islands, Stung Treng and Kratie to seek out the Mekong Irrawaddy dolphins. Enter a world of mountains, elephants and ethnic minorities before ending your adventure in Phnom Penh. 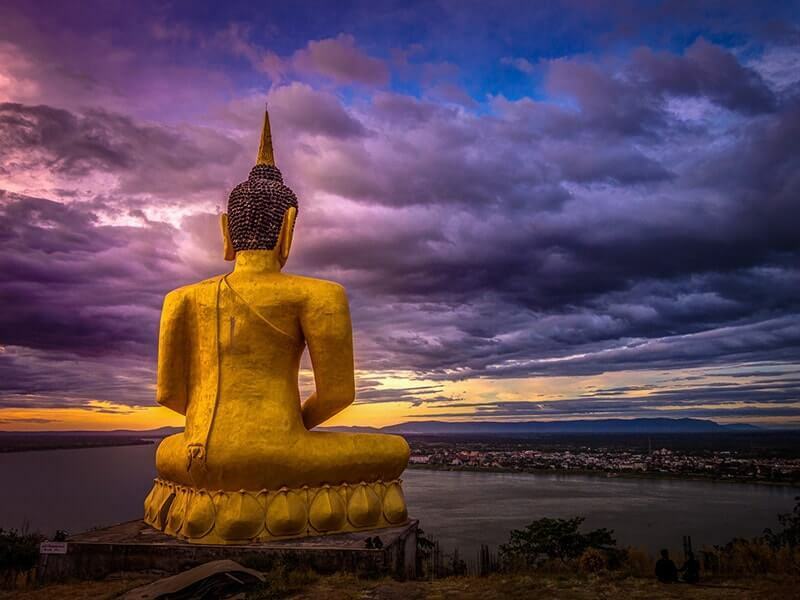 Welcome to PAKSE, the capital of Champasak Province and is a major transportation hub for southern Laos. 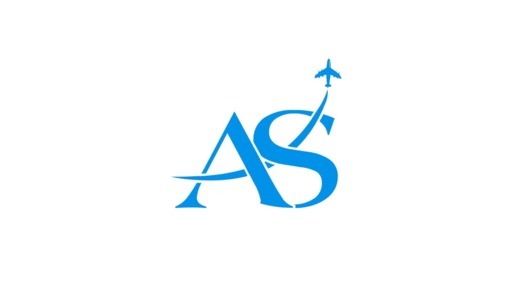 Upon arrival at the Pakse Airport, you will be welcomed by our local guide then transferred to your hotel for check in. After a short rest, take a short transfer (36km) to Bolaven Plateau. The plateau is located in an ancient volcano which erupted millennia ago and is full of lush vegetation, rich soil and a year-round temperate climate that is the perfect environment for growing Arabica and Robusta coffee. Along the way, you could see lush, beautiful coffee farms. 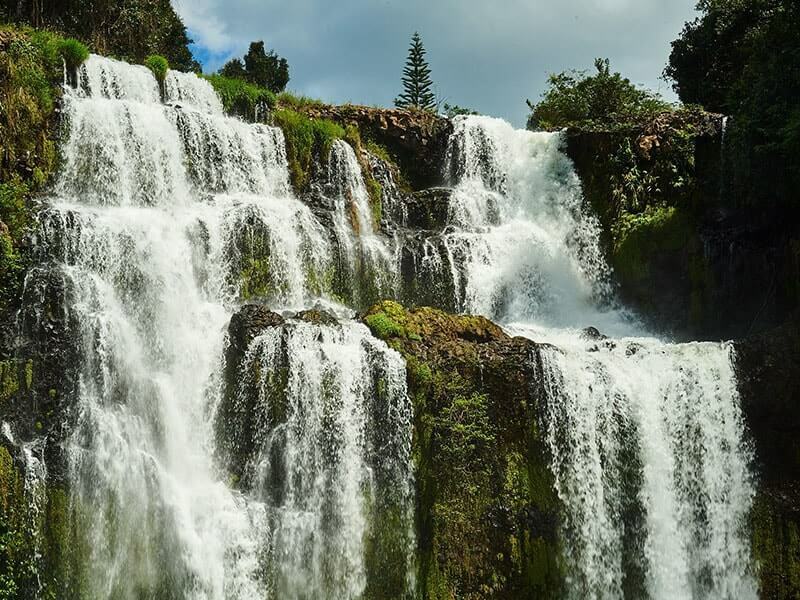 Visit E Tu Waterfall located between Pakse and PAKSONG, offering a serene place for refreshing swimming. Located 3 km afar, the Fane Waterfall which is the tallest waterfall in Bolaven Plateau and probably in Laos. Also stop to visit villages of ethnic minorities. Then drive back to Pakse for a complimentary dinner. Relax at the hotel and enjoy a cup of coffee - specialty of Bolaven Plateau. Today, head south to CHAMPASAK to visit Wat Phou - one of the oldest archaeological site in Laos built about 200 years before Angkor Wat. Located at the base of the Phu Kao Mountain, the temple has a unique structure, in which the elements lead to a shrine where a lingam dedicated to Lord Shiva was bathed in water from a mountain spring. The site later became a centre of Theravada Buddhist worship, which it remains today. 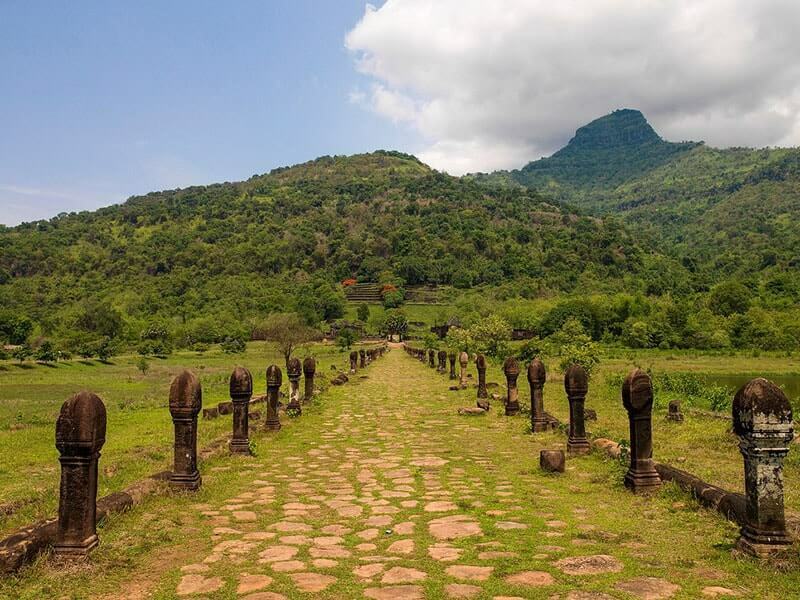 Wat Phou has been designated as the World Heritage Site by UNESCO in 2001. Next, enjoy a meal in Ban Wat That Village, a laidback township with friendly people and beautiful scenery, where you can enjoy a leisurely afternoon. Tonight you’ll check into the charming La Folie Lodge on DON DAENG ISLAND, complete with river views and manicured gardens. Overnight in Don Daeng Island. Explore more of Champasak today with a hike to the ruins of Um Tomo Temple, a Khmer-style temple located on the bank of the Mekong amid trees and rice fields. Next, it’s on to view traditional wood carvings in a local village. After that, return to Don Daeng Island where you end the day’s expedition with a tour of the river communities of Don Daeng. This area in the Mekong comprises more than 4,000 islands of various sizes, characterized by their laid-back pace the rustic wooden bungalows that comprise them. You'll get a rare glimpse of river life by visiting one of these communities, touring a local school, and meeting village elders. There is a chance to enjoy a traditional local meal of papaya salad (som tum), sticky rice, and grilled fish. The tiny DON KHONE ISLAND is your destination today. Measuring only 1.5 by 2.5 miles, this sleepy village sports thatch-roof huts and swaying palms, as well as a collection of old colonial buildings. Upon arrival, check in the hotel then take a tour of the colonial holdovers today, visiting old French villas and the narrow gauge railway that was constructed during World War II. In the afternoon, you'll take a local boat ride past the tiny islands dotted throughout this tropical paradise to Khone Phapheng and Li Phi Waterfalls. If you’re lucky, you might see some of the rare and elusive pink Irrawaddy dolphins. Numbers of the Irrawaddy dolphins in the area are critically low, but tourism drives support to conserve these friendly creatures, who can most typically be seen at the southern tip of the island. Overnight in Don Khone Island. Today you'll visit nearby islands, and take a day-trip to the silk weaving village of Ban Saphai. Ban Saphai is the historic capital of weaving in Champasak and it's here where you'll get a demonstration in "mut mee" weaving from local craftspeople and have the chance to pick up a traditional shoulder sash or skirt. Afterwards, explore the islands at your leisure by bicycle – the islands' most popular form of transport. 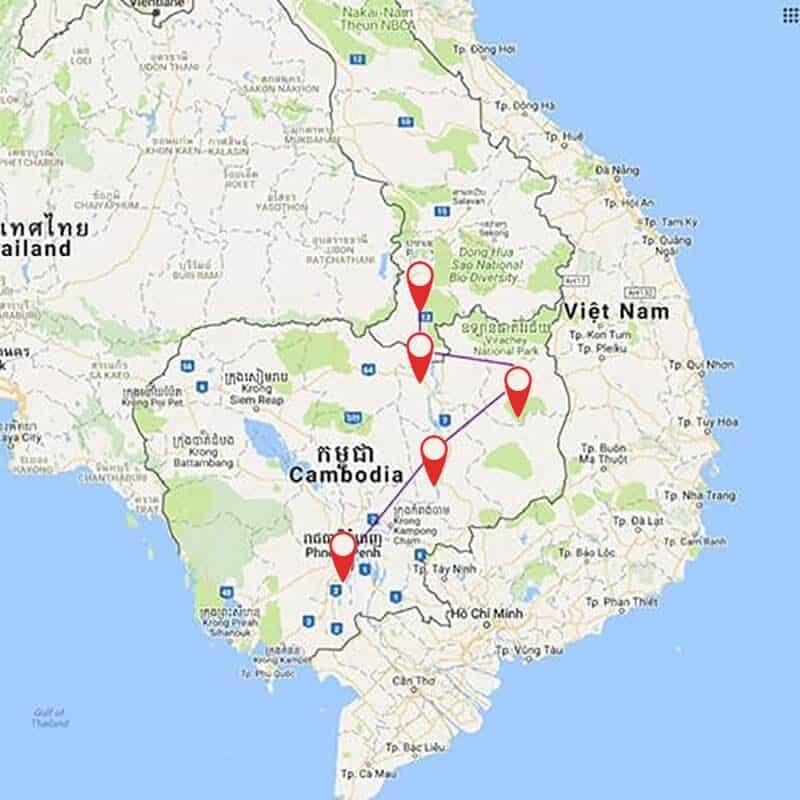 This day, bid farewell to Laos, then cross the Voen Kham border into Cambodia before heading with your local Cambodian guide to STUNG TRENG. 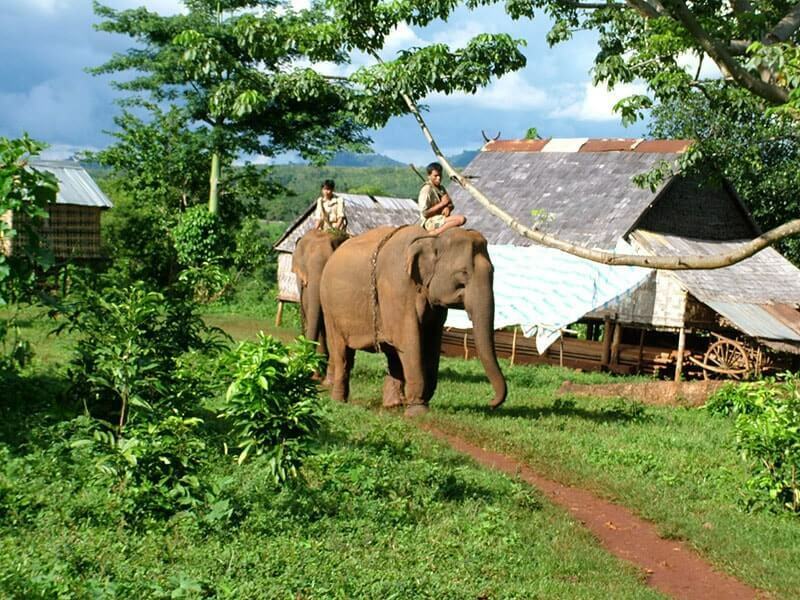 After a short break in Stung Treng, travel to BANLUNG, the capital of Ratanakiri Province in northeastern Cambodia. 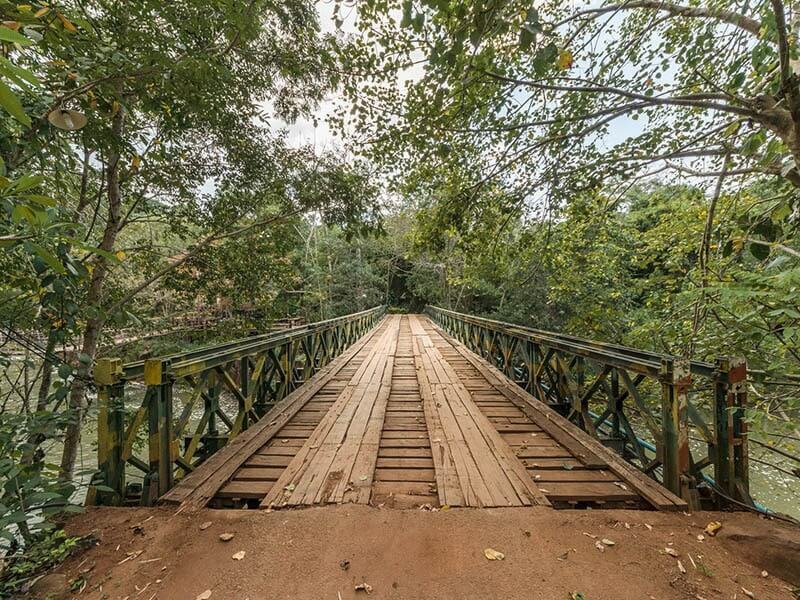 The drive takes you through rural area of the remote Ratanakiri Province which boasts some of the most striking landscapes of the area. The province is also home to several ethnic minority groups and natural attractions. You could watch scenes of rural life play out amidst a hazy, visceral sunset. Have lunch on the way at a local restaurant. Upon arrival in Banlung, you will be transferred to the hotel for check in. The rest of day, relax at hotel or stroll around discovering the town on your own leisure. Over the next few days, you will venture out to discover attractions of this remote area. After breakfast, take a short transfer (approximately 38 km from Banlung) to Voen Sai Village which is located on the bank of Tonle San river. The headquarters of Virachey National Park are located in the village. Upon arrival, walk around and discover the unique cultures of the village where Khmer people live alongside Lao, Chinese and Kreung minorities. From here, start our trekking tour to Virachey National Park, one of the most important wildlife and forest preservation areas in the whole of South East Asia. Along the trails, our guide is very pleasant to give you information about plants and animals which are living in Virachey National Park. Keep an eye out and you might spot wild animals and birds. If you are lucky, you could see a clouded leopard, elephants or a tiger. After the trek, you will be transferred back to Banlung then take a visit to Yeak Laom Lake, which was formed many centuries ago from a volcano. 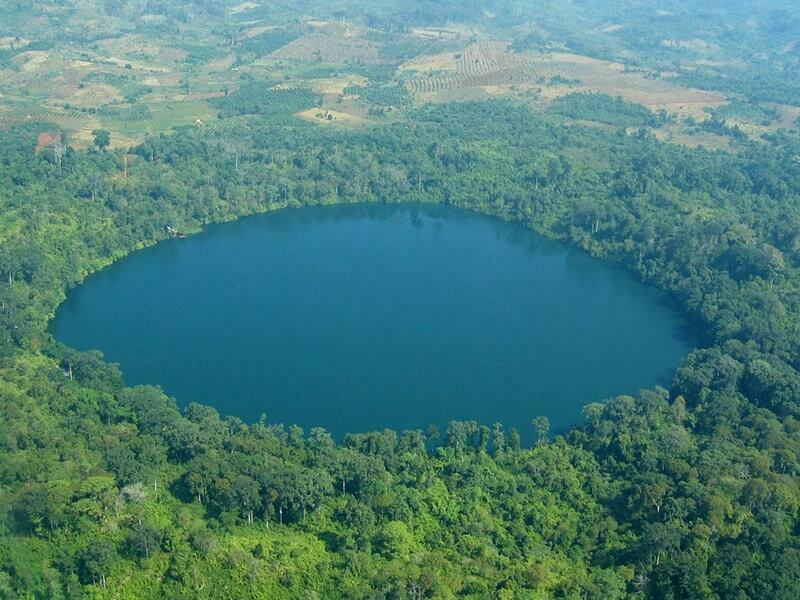 Swim in crystal clear waters and enjoy the beautiful scenery of this volcanic lake. Overnight at hotel in Banlung. This morning, travel to the small town of Borkeo to visit local mining communities and watch the precarious way the locals mine for amethyst and zircon. Then continue our trip to Andong Meas, a district in Ratanakiri Province, north-eastern Cambodia. Upon arrival, take a private boat to broad along the Tonle San River up to visit the villages on two sides of river. Lunch will be served on a beautiful island. After lunch, visit Jarai ancient cemeteries which house ancient graves and authentic wooden carving representing the dead people. Carved wooden statues such as the pregnant woman, soldier and elephant tusk are placed around the grave. There is a chance to visit a village of Kachock people. Observe their daily activities, chat with locals. In the late afternoon, you will be transferred back to Banlung. After breakfast, visit Katieng Waterfall which lies just 20 km from Banlung town. In hot months, locals often swim at this beautiful waterfall. After the visit, we continue our drive to Kratie en route stop for a short break in a local market where people sell deep fried spiders and other insect as their local special delicacy. Arrival in KRATIE in late afternoon, then spend some time at leisure to discover the small town of Kratie independently. Lunch is served at Le Tonlé Tourism, where young locals are trained in the principles of hospitality to ensure a better future in Kratie. Dining here involves delicious Khmer food paired with personalised service. Later in the afternoon, take a private boat to Koh Trong Island, only a short 10-minute boat ride from Kratie. This Mekong island displays typical Cambodian village life, where people’s livelihood largely depends on rice farming and fruits cultivation (Koh Trong is famous for its pomelo!). Upon arrival, check into the hotel and enjoy some time at leisure to enjoy the environment. Overnight at hotel in Koh Trong Island. 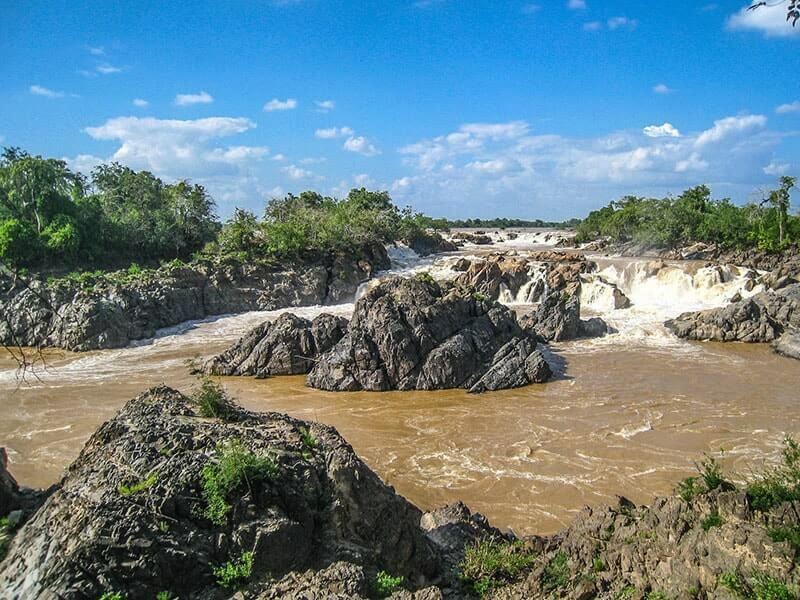 Kratie today is a small riverside city which lies on the banks of the Mekong River and an emerging tourist destination in Cambodia. It is well-known for its French colonial buildings and the rare Irrawaddy dolphins. After breakfast, drive to the Kampi Village, around 16 km north of Kratie. Here is the home of 80 of the dwindling population of Mekong Irrawaddy dolphins. The swirling waters here are considered one of the best places to observe these dolphins. Then, transfer back to Kratie around noon time. Have lunch and take a boat back to Koh Trong Island. In the afternoon, join with us in a kayaking trip to big islands with white sand beaches within the Mekong. After an hour of kayaking, return to your hotel then relax at leisure. Those wishing to explore further can hop on a bicycle or horse cart to visit villages and observe daily life of villagers. At the end of day, watch the sunset from the island’s western banks. In the morning, drive to the capital of PHNOM PENH via Kampong Cham, a city quaint and charming with its bustling morning river scene and wide boulevard streets beside the river. Arrive in Phnom Penh at noontime, you will be transferred to the hotel for check in. After a short rest, start our half day tour of Phnom Penh. First, we visit the Royal Palace built in 1866 by King Norodom. It serves as the King's residence and is used as a venue for court ceremony. Then we move to the Silver Pagoda which is located in the southern portion of the Royal Palace complex. The pagoda houses large collection of Buddha images crafted from gold, silver, jade or wood and stone including the "Emerald Buddha", which sits atop throne in the center of the pagoda. Afterwards, visit the National Museum, Cambodia’s largest museum of cultural history and is the country’s leading historical and archaeological museum. In the late afternoon, take a walk along the riverside promenade, filled with food stalls, people exercising and courting couples. 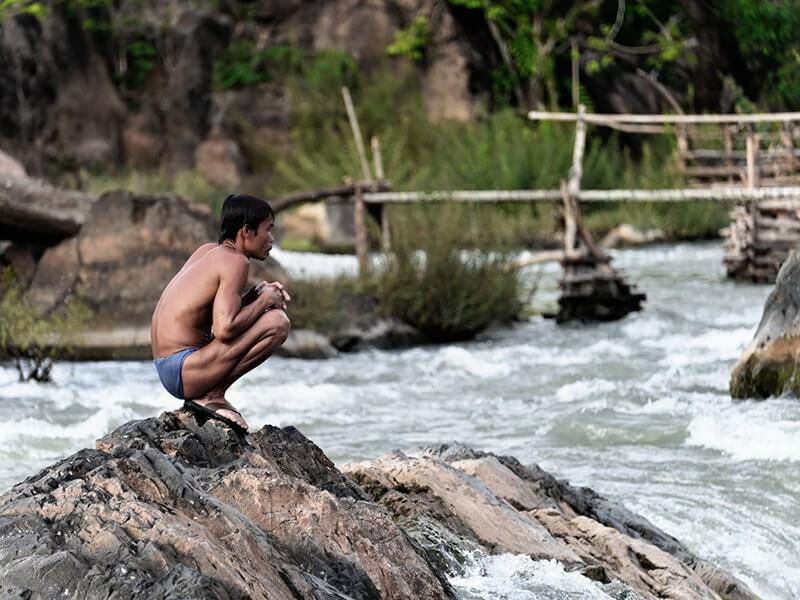 Wrap up the undiscovered Southern Laos & Cambodia today. Depend on your actual departure time, some soft sightseeing for an orientation tour of Phnom Penh will be suggested. Or free at leisure before you are transferred to Phnom Penh International Airport for your onward flight. Items of a personal nature such as laundry, drinks, souvenirs, etc.